One time Blackhawk Steve Sullivan, Matt Cooke, Joe Vitale and Evgeni Malkin scored, and the Pittsburgh Penguins held on to beat the Hawks 4-2 on Friday to remain perfect in preseason play.Brent Johnson stopped 35 shots for the Penguins (5-0-0).Rookie Brandon Pirri scored two goals for the Blackhawks (2-3-1) and Ray Emery — competing for the backup job with rookie Alexander Salak, started and stopped 15 shots.Sullivan, who signed with Pittsburgh as a free agent and was nursing a groin injury during training camp, also had an assist in his preseason debut.Vitale made it 3-0 with about 7½ minutes to go in the second period, sliding a loose puck between Emery’s left skate and the post.Pirri’s power-play goal with 42 seconds left in the second cut it to 3-1. He pulled the Hawks within a goal midway through the third as he took a pass from Bryan Bickell in front of the crease and spun a backhand shot past Johnson.Malkin fired a power-play goal into an empty net with 42 seconds remaining to complete the scoring.Sullivan made it 1-0 on a power-play goal with about 3½ minutes remaining in the first period as his screened shot from the top of the left circle slipped past Emery on the stick side.Emery’s clearing pass set up a short-handed goal by Pittsburgh Matt Cooke at 7:19 of the second. Emery came far out of the net to fire the puck away from onrushing Penguins forward Pascal Dupuis, and banked the it off the boards to center ice. The puck landed on Cooke’s stick and he fired it from the red line into an empty net before Emery could get back. NOTES—Joel Quenneville said rookie RW Ben Smith is out day-to-day. Smith took a shoulder to the head from Detroit rookie D Brendan Smith in the third period of a game in the United Center on Wednesday. Brendan Smith, who received a match penalty on the play, was suspended by the NHL on Friday for the remainder of the preseason and the first five games of the regular season…..LW Viktor Stalberg will miss three weeks with a lower-body injury suffered Wednesday against Detroit. Sale blows lead in 9th, Jays take finale 3-2. Some White Sox players cleaned out their belongings and scurried out the clubhouse door, hoping to catch flights home. Others took care of business around their lockers and traded goodbyes and handshakes.Whatever last-minute chores remained Wednesday, the disappointing season — one that seemed to spin out of control at the end — was finally over.It concluded in a fitting manner, as hard-throwing reliever Chris Sale issued two bases-loaded walks in the ninth inning and the Toronto Blue Jays rallied for a 3-2 win. Earlier in the day, Ozzie Guillen was announced as the new manager of the Florida Marlins — the White Sox released him from his contract Monday. Expected to be a contender in the AL Central, the White Sox wound up 79-83. “It’s always sour [for] every team that doesn’t go on to win the World Series. Every year seems the same when you lose. You say your goodbyes, but it eats at you a little bit,” said left fielder Juan Pierre, who will be a free agent. And now the search for a new manager begins with general manager Kenny Williams saying he has a short list and a preferred candidate. Hitting coach Greg Walker also announced before the game Wednesday he was stepping down. The Blue Jays’ victory gave them an 81-81 mark under rookie manager John Farrell as they finished fourth in the tough AL East. Kelly Johnson doubled to start the ninth with Toronto trailing 2-1 and moved to third on David Cooper’s single. Colby Rasmus sacrificed Cooper to second before J.P. Arencibia was walked intentionally to load the bases. Sale (2-2) then walked Mark Teahen and Adam Loewen back-to-back, putting the Blue Jays ahead.The rally denied Phil Humber his 10th victory after he gave up just two hits and a run in 6 2/3 innings while fanning a career-high nine. Shawn Camp (6-3) pitched the eighth for the win. Frank Francisco worked the ninth for his 17th save in 21 chances.The White Sox went ahead 2-1 in the fifth when Alexei Ramirez doubled down the third base line and a fan picked up the ball after it went into foul territory. Alejandro De Aza had opened with a single and raced home on the play. But instead of sending De Aza back to third after the fan interference, umpires decided he was far enough around the bases and would have scored regardless, so the run counted. Farrell came out of the dugout, but there was no long argument. Toronto’s Eric Thames, the second batter in the game, hit an RBI double after a leadoff walk to Mike McCoy. The Blue Jays didn’t get another hit until Teahen singled off Ramirez’s glove at short in the seventh to finish Humber. The Cubs had tied it in the fourth on Gordon Beckham’s 10th homer, ending a streak of 18 scoreless innings by Blue Jays starter Brandon Morrow. Morrow gave up five hits and two runs in six innings. Adam Dunn, who needed six plate appearances in the final game to finish with the worst qualifying batting average in modern big-league history, sat out the game. He finished with a .159 average in 496 plate appearances, had a club-record 177 strikeouts and hit only 11 homers with 42 RBI after signing a four-year, $56 million dollar contract. NOTES—Blue Jays slugger Jose Bautista, who hit 43 homers and could finish as the major home run league champion in back-to-back seasons, wasn’t shy when asked who should be the AL MVP. “If I couldn’t vote for myself, then Miguel Cabrera,” he said of the Tigers star.” But if he could vote for himself, would he? “Wouldn’t you?” Bautista said….Mark Buehrle, who has pitched at least 200 innings in every season since 2001 and will be a free agent, reiterated that he had no idea if he would resign with the only team he’s ever played for. Buehrle said his preference is to return but added it might be interesting to see how another organization works. Either way, he said the White Sox don’t owe him anything. He signed a four-year, $56 million deal in 2007. “They’ve given me plenty, they’ve given me a chance to play baseball and given me tons of money,” Buehrle said….Attendance was 20,524, running the season total at U.S. Cellular Field to 2,001,262…..Morrow struck out seven, giving him 203 for the season and making him the fourth Blue Jays pitcher to fan at least 200. SAN DIEGO—The San Diego Padres won their first and last games of the 2011 season.The Padres beat the Cubs 9-2 on Wednesday night. Will Venable hit his first career grand slam and Nick Hundley hit a three-run shot to lift the normally punchless Padres.Starlin Castro became the youngest player — at 21 years, 188 days — to lead the NL with 207 hits. He doubled in the eighth to reach base in a career-high 40 straight games and extend his hitting streak to 10 games. He also hit a sacrifice fly in the fifth. The teams both finished 71-91. The season was especially disappointing for the Padres. They won 90 games last year and took their postseason chances down to the last day. They traded All-Star Adrian Gonzalez to Boston in December, got off to a horrible start and never recovered. The late power surge might not be enough to save hitting coach Randy Ready’s job. Since moving into spacious Petco Park in 2004, the Padres have fired their hitting coach three times and would have dismissed Wally Joyner in 2008 if he hadn’t resigned with six games left. Despite the two homers, the Padres finished with a major league-low 91. The Padres and Astros (95) were the only big league teams with fewer than 100. Venable and Hundley tied Cameron Maybin for the team home run lead with nine. Venable hit an opposite-field slam to left to chase Ryan Dempster in the sixth. Dempster retired the first two batters before loading the bases on singles by Andy Parrino and starter Wade LeBlanc, and a walk to Maybin. Hundley homered into the second deck in left field to cap the four-run third. Dempster retired the first two batters before walking LeBlanc, who scored on Maybin’s RBI double. Venable walked ahead of Hundley’s homer.LeBlanc (5-6) allowed two runs and five hits in seven innings, struck out three and walked two. Dempster (10-14) allowed nine runs and eight hits in 5 2/3 innings, struck out seven and walked four. The 14 losses extended his career-high, and he matched his career-high with his sixth straight loss, over eight starts. NOTES—Asked if Ready’s job is safe, Padres general manager Jed Hoyer said: “I’m not going to answer that.” If Ready is canned, he’d be the fifth Padres hitting coach to be let go since the downtown ballpark opened in 2004. Dave Magadan was fired on June 15, 2006, and was replaced by Merv Rettenmund. Rettenmund was fired on July 31, 2007, and replaced by Joyner. Jim Lefebvre was hired before the 2009 season, was pink-slipped that July 31 and replaced by Ready. … Hoyer will meet with the media on Thursday to discuss the Padres’ dismal season. … Closer Heath Bell, San Diego’s only All-Star, said he has a “gut instinct” he’ll be back next season. “I’m not planning to clean out my locker,” said Bell, who added that he was taking only a few of his son’s things, plus his glove and a few pairs of shoes so he can work out at his home in northern San Diego County and some nearby high schools. … Maybin became the ninth Padres player in history to steal 40 bases. Mark Buehrle came out to warm up for the eighth inning, looked around and saw there was no ball on the mound and no fielders surrounding him. Surprised? Sort of. It was all part of a salute pre-planned by teammate Paul Konerko and acting manger Don Cooper to make sure the durable and popular left-hander got the spotlight on what might have been his final game for the White Sox.Buehrle threw seven shutout innings Tuesday night and the Sox beat The Toronto Blue Jays 2-1. Eligible for free agency following the season, he’s not sure where he’ll land in 2012. But he’ll certainly remember the tribute, from both his teammates and the fans. As he walked off the field after Cooper pulled him, Buehrle waved to the fans who were chanting his name and hugged his teammates as they headed to the field. Several minutes later, Buehrle emerged again from the dugout for a curtain call, taking off his cap and extending his arms toward the small but spirited crowd announced at 23,934. The White Sox played their first game since Ozzie Guillen was released from his contract after Monday night’s victory over the Blue Jays.Cooper enjoyed the beginning of his short stint as manager. He also went to the bullpen pregame to watch Buehrle warm up and made sure to give him a few verbal jabs. Buehrle (13-9) allowed six hits, struck out six and walked none.General manager Kenny Williams said before Tuesday night’s game he didn’t know yet whether Buehrle fit into the team’s future plans. Buehrle is 161-119 in his career. The fast-working lefty has a no-hitter and a perfect game on his White Sox resume from a career that began in 2000. He reached the 200-inning mark for the 11th straight season when he got the second out of the second inning, and he’s had at least 10 wins and 30 starts every season since 2001. Buehrle would love to return, but knows the White Sox are in store for big changes following this disappointing season, Guillen’s departure and the failure of some highly paid players like Adam Dunn and Alex Rios to produce this season. He said he didn’t know if he’d pitched his final game for the team that drafted him in 38th round in 1998. Tyler Flowers hit a solo homer, his fifth of the season, off Henderson Alvarez (1-3) in the second. A.J. Pierzynski singled home a run in the sixth.Toronto’s Mike McCoy greeted Jesse Crain with his second homer to cut the lead to 2-1.Chris Sale got the final five outs to earn his eighth save in nine chances.Alvarez allowed seven hits in seven innings. Blue Jays manager John Farrell also lauded Buehrle.Dunn went 0 for 3 with three strikeouts, dropping his average to .159 with a franchise-record 177 strikeouts. Dunn needs six plate appearances in the final game to finish with the worst qualifying batting average in modern big league history, surpassing Rob Deer’s .179 mark in 1991. NOTES—Phil Humber (9-9) makes his 28th appearance and 26th start in Wednesday’s season finale. Humber is 1-5 with a 6.15 ERA in his last 10 starts. He is 0-0 with a 4.50 ERA in three career games, including a start, against the Blue Jays. Toronto counters with Brandon Morrow (11-11), whose 10.18 strikeouts per nine innings leads the American League. … Omar Vizquel, at age 44, said he’d like to play another season, but is not sure if he’ll try to follow Guillen to Florida — should he become Marlins manager — or maybe stick with the White Sox another season. He did attend Guillen’s final news conference Monday to show support for his fellow Venezuelan. … Toronto’s Edwin Encarnacion has an inflamed nerve in his left shoulder but no structural problems. He has not been ruled out of Wednesday’s season finale. … Pierzynski reached 1,000 innings caught for the 10th straight season. … Dave Nicholson struck out 175 times for the White Sox in 1963. After eight VERY interesting years.the White Sox have agreed to Ozzie Guillen’s request to be released from his contract, allowing him to pursue other opportunities. Guillen, who led the White Sox to a 78-82 mark in 2011 and a 678-617 record during his eight seasons (2004-11) as manager, will not be in uniform with the White Sox for the remaining two games of the 2011 season. 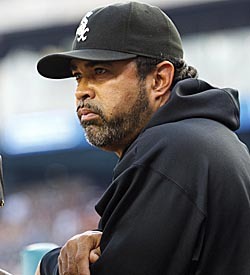 The White Sox retain rights to compensation should Guillen accept a managerial position with another major league team in 2012. Guillen was traded to the Sox by San Diego in 1985 for 1983 Cy Young winner Lamar Hoyt and was the American League Rookie of the Year. He stayed with the Sox through 1997,joined the Atlanta Braves,then worked as a Coach for Bobby Cox before joining the Florida Marlins where he was a Coach on the 2003 World Champs,prior to rejoining the Sox. Devin Hester mixes it up with Green Bay’s Tramon Williams after Kellen Davis’ touchdown during the 4th quarter. ***For now,the Lovie magic against Green Bay has gone away. Under Lovie Smith,the Bears have lost five of their last six against the Packers,and are now 8-8 overall during the Smith era(since 2004)against GB. ***The loss yesterday had some similarities to last January’s NFC Title Game,and some items that were different. Last January,the Bears won the toss,and deferred. This time Green Bay won the toss. In both cases,Aaron Rodgers drove the Packers right down the field for a quick 7-0 lead,and Green Bay led the entire day. This time Jay Cutler stayed healthy and finished the game.He was sacked JUST three times Sunday. ***The Bears tried to run the ball but could not. How about only 13 yards rushing(on 14 attempts), The Bears worst total in 59 years and their second lowest ever! The Bears had only one rushing yard against the L.A.Rams in 1952. Get off the bus running huh! Brutal. ***The Bears have now dropped 15 of their last twenty meeting with Green Bay at Soldier Field.At least they still lead Green Bay all time 92-85-6(including 1-1 in Post Season games). ***No doubt,it’s back to the drawing board as Cam Newton,Steve Smith,Greg Olson and Coach Ron Rivera invade the Lakefront next Sunday. ***The Cubs were able to lose to the Cardinals straight up Sunday after Saturday’s brutal ninth inning meltdown of wildness by Carlos Marmol who blew his TENTH save of the season by walking the bases full, then issuing a bases loaded walk to force in the tying run,and unleashing a VERY WILD PITCH to send the winning tally across the plate. It’s time during this off season,that whomever becomes the Cubs new GM, deal Marmol and get the most possible. He’s way too wild to be a closer. He needs a change of scenery! ***As for the White Sox, with their loss to Kansas City Sunday,they clinched their third below .500 record since Ozzie Guillen became Manager in 2004. And THIS from a team that was supposed to have their way in the so called weak A.L.Central(I also picked them to win that Division!). Worse for the Sox, their season ending free-fall has cost them second place too. One more win by Cleveland,or Sox loss,and they finish in third place.Lately they have been very far removed from ALL IN. This one was somewhat similar to Green Bay’s last visit here in January for the NFC Title. Unlike that game,the Packers won the toss and chose to receive,but like the Jan meeting, Aaron Rodgers took his team right down the field and the Bears trailed the entire game-again.Rodgers threw three touchdown passes to tight end Jermichael Finley and the Packers, controlling the ball for most of the game against a one-dimensional offense of the Bears, posted a 27-17 win at Soldier Field to improve their record to 3-0.The defending Super Bowl champion Packers, who beat the Bears in the final regular-season game to qualify for the playoffs a year ago and then in the aforementioned NFC Championship Game, led all the way. It was Green Bay’s 15th victory in its last 20 games at Soldier Field.Rodgers took advantage of an injury-depleted Bears secondary, which had to use two backup safeties in the starting lineup, to drive for a touchdown on the game’s first drive, completing 5 of 7 passes for 67 yards. The Bears never caught up and, worse, gave up on the running game, which enabled Green Bay to control the ball for most of the game, too, compiling a 15-minute advantage in time of possession.The Bears finished the game with just 13 yards rushing (all but two of it coming in the fourth quarter), its lowest total in nearly six decades and the second lowest in its history; the Bears rushed for just one yard against the Los Angeles Rams in a 1952 game.And now Mike Martz can chirp “told you so” if he wants,which is not at all good news for Bears fans.Rodgers completed 28 of 38 attempts for 297 yards, including the touchdown passes to Finley of 6 yards in the first quarter, 7 yards in the second quarter and 10 yards in the fourth quarter. He also threw his first interception of the season late in the fourth quarter on Brian Urlacher’s second, all-out diving theft in three games. Ryan Grant rushed for 92 yards on 17 carries. Despite its 3-0 start, Green Bay showed it has a lot of work still to do and played poorly enough to lose the game had the Bears not been so inept themselves.The Packers’ offense sputtered after the fast start and was repeatedly victimized by mostly self-inflicted errors. They were penalized four times for false starts, once for an illegal formation and once for a delay of game. The Packers also lost Bryan Bulaga, their right tackle, early in the game due to a knee injury and had to insert a backup, Marshall Newhouse.None of that mattered, however, because the Bears gave up early on the run, the Packers’ defense kept Jay Cutler under pressure most of the game, and Bears’ receivers dropped several passes.Cutler completed 21 of 37 passes for 302 yards, but threw two interceptions and was sacked three times.The Bears had been criticized for a one-dimensional offense in losing a week earlier against New Orleans, and offensive coordinator Mike Martz said he got the message and would use a more balanced approach against the Packers. But even though the game was relatively close most of the day, running back Matt Forte had only nine carries. NOTES—The Bears host Carolina at noon next Sunday….The Bears wore their orange uniform tops which they have done in their second home game of the Regular Season since 2005. Cards stay alive with 3-2 win over Cubs. Just three games left! ST. LOUIS—The St. Louis Cardinals pulled within one game of the Atlanta Braves in the NL wild-card race as Rafael Furcal hit a tiebreaking home run in the eighth inning Sunday in a 3-2 victory over the Cubs.St. Louis trailed Atlanta by 10 1-2 games on Aug. 26, but the Cardinals have won 15 of their last 20.The Cardinals close with a three-game series at Houston, which has the worst record in the major leagues, while Atlanta hosts Philadelphia, which has the best mark.Trailing 2-1, St. Louis tied the score in the seventh on Yadier Molina’s career-best 14th homer. The following inning, Furcal homered off Randy Wells (7-6).Octavio Dotel (5-3) retired two batters in the eighth, and Jason Motte pitched a perfect ninth for his ninth save in 13 chances.Making what might have been his final home appearance for the Cardinals, Albert Pujols went 0 for 4 and stopped his streak of reaching base in 40 successive games. The three-time NL MVP, who is eligible for free agency, received a 45-second standing ovation during his first at-bat. He stepped out of the batter’s box and tipped his helmet.Cardinals starter Edwin Jackson allowed two runs and five hits in seven innings. Wells, who grew up in the St. Louis suburb of Belleville, Ill., gave up three runs in eight innings.Geovany Soto’s sacrifice fly put the Cubs ahead in the fourth, but Jackson’s sacrifice fly tied it in the fifth. NOTES—In the event of a tie, St. Louis would host a tiebreaker game Thursday because the Cardinals beat the Braves 2-1 in the season series. … The Cardinals’ Jaime Garcia (13-7, 3.45) will face Houston’s Wandy Rodriguez (11-11, 3.51) on Monday. … The Cubs’ Starlin Castro leads the NL with 203 hits. He has reached safely in a career-high 37 consecutive games. … St. Louis passed the 3 million mark in home attendance for the eighth successive season and, barring a tiebreaker, finished at 3,093,954, including 41,469 on Sunday. Royals win 2-1, Sox clinch losing record. Luis Mendoza pitched into the eighth inning for his second consecutive victory and Jarrod Dyson hit a two-run double to lift the Kansas City Royals over the White Sox 2-1 on Sunday. The Sox lost for the 11th time in 15 games and with its 82nd defeat ensured the third losing record in manager Ozzie Guillen’s eight-year tenure.The young Royals continued their late-season surge, winning for the 10th time in 13 games.Mendoza (2-0) limited the Sox to one run and five hits over 7 2/3 innings after holding AL Central champion Detroit to two runs in seven innings last Tuesday, his first big league start in nearly a year and a half. The Pacific Coast League pitcher of the year struck out four and walked two. Greg Holland got four outs for his fourth save.Gavin Floyd carried a no-hitter into the sixth inning before Lorenzo Cain and Chris Getz opened with back-to-back singles. After advancing on Alcides Escobar’s sacrifice, Cain and Getz scored on Dyson’s double down the right-field line. It was the second straight day a White Sox starter carried a no-hitter into the middle innings. On Saturday, John Danks was perfect for 4 2/3 innings before Salvador Perez singled. Floyd (12-13) matched his season high with 10 strikeouts and held Kansas City to two runs and three hits over eight innings. Still, he finished with a losing record for the second consecutive season. Adam Dunn went 0 for 3 with a walk, dropping his average to .161. Dunn needs 13 plate appearances in the final three games to finish with the worst qualifying batting average in big league history, surpassing Rob Deer’s .179 mark in 1991. The 27-year-old Mendoza was 12-5 with a 2.18 ERA for Triple-A Omaha and was selected the PCL’s playoff MVP for his role in leading the Storm Chasers to the league title. But he hadn’t won a game in the majors since Aug. 3, 2008, until he beat the Tigers last Tuesday. Mendoza had to wait only five days for another win. The Sox failed to put more than one baserunner on in any inning against him until Gordon Beckham and Alexei Ramirez singled in the eighth.Holland replaced Mendoza and gave up a bloop double to Paul Konerko, trimming Kansas City’s lead to one. After A.J. Pierzynski was intentionally walked, Dayan Viciedo struck out with the bases loaded to end the inning. NOTES—Melky Cabrera went 0 for 4 and still needs one hit to become the seventh player in Royals history to reach 200 in a season. …Alex Rios was shaken up in the fourth when he made a running catch and banged into one of the supports that hold up the screen on the fence in right-center at U.S. Cellular Field. He was removed from the game for precautionary reasons and replaced by Viciedo. … The Royals start a season-ending series at Minnesota on Monday with Felipe Paulino starting the opener against Kevin Slowey. Paulino lost at Target Field on July 17 in his only career appearance against Minnesota. … The White Sox wrap up their campaign with a three-game set at home against Toronto. Dylan Axelrod will seek his first big league win in his third start against scheduled Blue Jays starter Dustin McGowan.